This review is split into two parts for a couple of reasons. The first is that it will not be short, and the second is that it seems at present to be a different game depending on your style or level of play. This first part is about how the game works for casual players who get together with a mate and play with whatever they’ve got. They play for fun and next time they meet they’ll probably use the same or very similar army because that’s what they have. The second part builds on this foundation and is a more in-depth look at specific details that affect more serious players who pore over army lists in detail and will tweak their armies to maximise their effectiveness. This includes tournament players, but is not restricted to them. For example, this is how I generally play. The copy I have was given to me by Mantic. It will soon be available for free as a B&W pdf from their website as well as to buy if you fancy a copy in glorious colour. As this is a review of the 2nd edition I understand that the rules are not yet completely locked down or finished. However, even taking that into account, you need to be able to play something with them and they have had a year to mature already. So, with that at the back of our minds, how do the rules work? I won’t go through all the rules in detail as you can download a set for yourselves (I’ll link this to the 2010 edition for the moment, and try and remember to change it when the new one comes out in a fortnight). Let’s look at the basics though. Kings of War is a tabletop fantasy battle game. This means that each player fields a force comprising units of infantry, cavalry and characters from a variety of possible races: Elf, Dwarf, Human, Twilight Kin (Dark Elf), Abyssal Dwarf (sort of Chaos Dwarf), Orcs, Goblins and Undead. 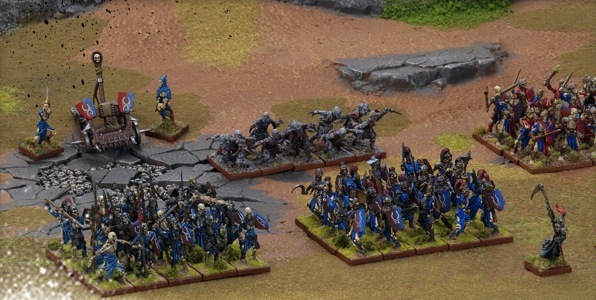 In KOW a unit does not take casualties: it is either all present on the table or it is removed completely. It will, however, take damage which will need to be represented with tokens of some sort. This retention of whole units reminds me of the DBA family of games, and allows you to model the whole unit on a single giant base should you choose to. The game is played in turns with a player moving, shooting and fighting with all of his army in his turn. The player turns are entirely separate and I wasn’t the only one who kept reaching for dice when my opponent attacked (so I could roll my saves – many years of conditioning by Warhammer). In KOW the attacker rolls everything. Alessio has said that this is to avoid unscrupulous players wasting time in tournaments where they could deliberately drag their feet when it came to rolling stuff. It does mitigate that particular flavour of naughtiness, though I don’t believe for a second that it will stop cheats cheating. They’ll just move their nasty behaviour elsewhere. A player turn has three steps: movement, shooting, melee. Movement rules are pretty straightforward. You can move double, move single and turn or turn in place. Whether you move or not also impacts on shooting effectiveness. This is all pretty standard stuff and is clean and simple, though the fact that distances are sometimes measured from the nearest bit of the unit and sometimes from the champion of a unit could trip up the unwary. Terrain is the familiar half move for difficult, etc. One particularly important rules here is that you may pre-measure. I’ll deal more with this in the second part, but for now be aware that you cannot, for example, have a failed charge as you can in Warhammer, or declare a shot that cannot reach. You can always check in advance. Once you’ve moved all the units you want to then it’s time to shoot. Magic in Kings of War is perfunctory and pretty characterless. All magicians share the same spells (with the exception of Undead who get an extra one): Zap and Heal. No prizes for guessing what they do. Each is simply a case of rolling a given number of dice, and each one that is 4+ either causes or heals a point of damage. These two “spells” count as missile attacks, and so you can only use one a turn. Normal shooting has a couple of potential modifiers that you can easily memorise. Otherwise shooting is merely a case of rolling the number of dice your stat line tells you and trying to get the number given or better. For example, an Elf Bowmen regiment has 10 dice and needs 4+ to hit. Very easy. If you hit a unit then you roll a dice per hit to see if you damage them. If you damage a target then you roll a Nerve test for them to see how happy they are. I’ll cover this last bit in a moment. After shooting, any of your units that has moved into contact gets to fight. Again, this is simply a case of rolling the number of dice you have on your stat line against the value listed. 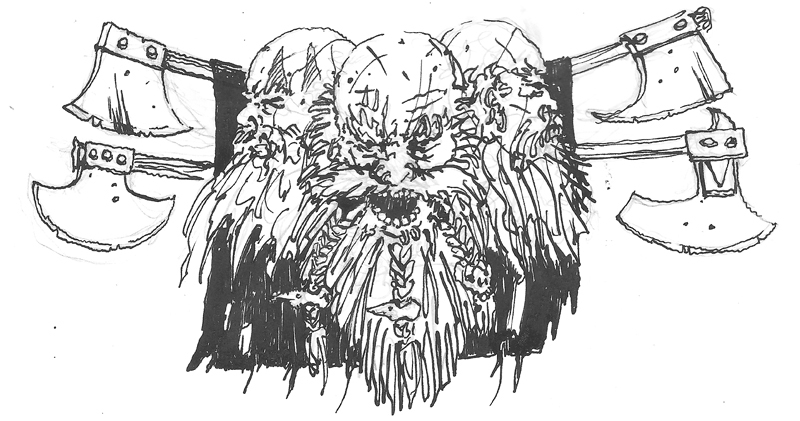 A lone Dwarf Warsmith would roll 2 dice, needing 4+ to hit. 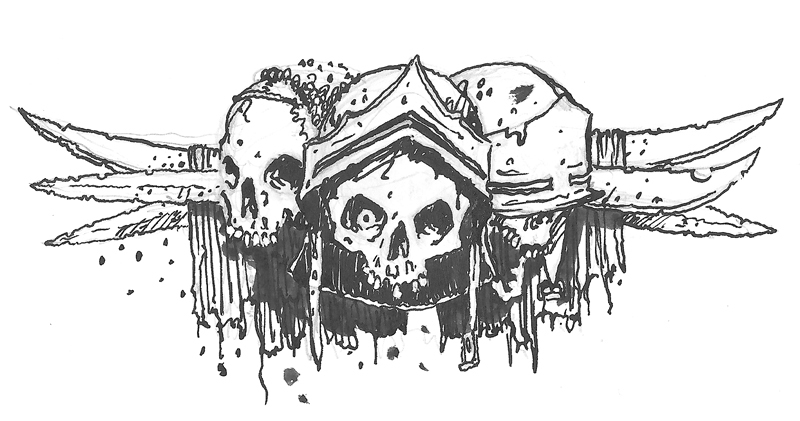 A horde of 20 human knights would roll 32 dice, needing 3+. Any dice that hit are rolled again to see if you can best the defence of the target, just as with shooting. After fighting you will roll a Nerve test for each unit you have damaged. Nerve tests have been streamlined since 1st edition. Now they are listed as two numbers on the stat line. When you damage a unit you roll 2D6 and add the amount of cumulative damage on the unit. If you equal or beat the higher value then the unit routs and is removed from play. If you equal or beat the lower value then it wavers for a turn (unless it’s Undead), basically standing about doing very little except waiting to get hit again. Someone else will have to come and save it. On top of this you have a handful of special rules that tweak the core rules to do the sorts of things you might expect. Really hitty units get to add to the rolls to damage things they hit, nippy units get extra movement, stuff with wings can Fly, and so on. One word of caution about those of you that are driven by background colour rather than game play: there isn’t any. Well, that’s not strictly true, but it is limited to the odd sentence here and there rather than pages of colour text that you’ll see in Warmachine, Warhammer, etc. I think that’s slated to come in with the 3rd edition (though the Mantic website and Journal already has additional background text so you can get a sense of what’s on the way). The first time I played Kings of War I was not at all taken by the complete lack of interaction in the player turns. I am still not a big fan of this feature, though the game plays so fast that it is less of an issue than I had expected. I doubt many casual players will bother with the chess clocks and timed turns (ostensibly the whole reason for the lack of player interaction), which is a pity as this is an interesting aspect and worth trying at least once. However, to give you an idea of how quickly KOW plays, we were experimenting with various timed games at the tournament and 30 minutes per player is reasonably tight for a 1,500 point game, but entirely possible. 45 minutes each is ample. This means that in a typical evening’s play I could easily fit in two whole games without being rushed. The rules are simple, clearly written and easy to pick up. There are no mechanical surprises to speak of, so anyone with a bit of gaming experience should know what they’re doing by the end of their first game. Anyone who has played a tabletop game will be familiar with the interplay of units, and the way infantry, cavalry and war engines interact is quite similar to games like Warhammer. Each arm does what you’d expect, which is good. 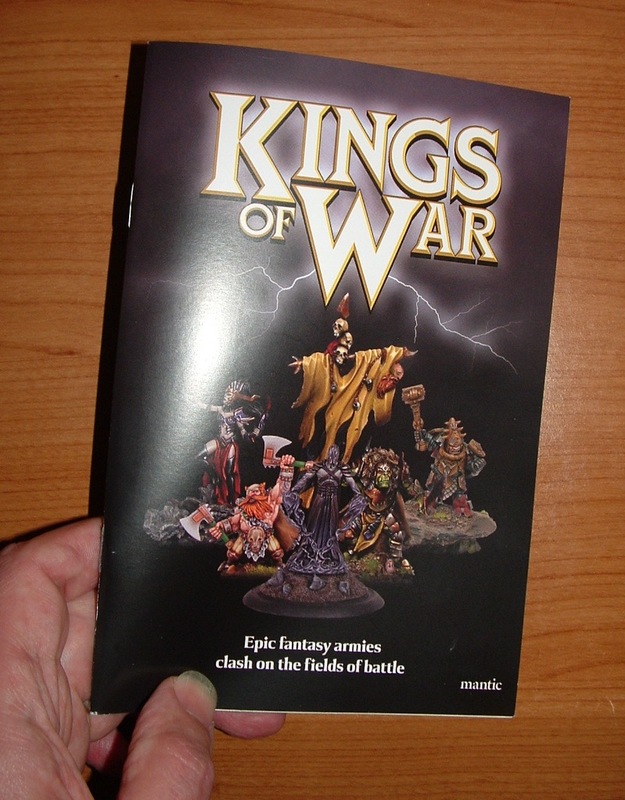 For casual play Kings of War should be very popular. It’s simple to pick up, fast to play and doesn’t require you to wade through a phone directory every 5 minutes to look things up. If you already have a Warhammer army then I urge you to give it a go for yourself. If you’ve got a Mantic army, even better. It’s free, so what have you got to lose? Regardless of any gripes I may have, Kings of War is definitely worth a try. …..it does what it says on the tin……….which is nice. Playing tonight at the club I run which has greeted KOW with open arms and it is highly regarded. My Undead vs. Elves. Should be a good one. Sounds like fun. Let us know how you get on. KOW is indeed very much as advertised, which makes a refreshing change. I think that’s a fair assessment. The aspect of KoW me and my friends are most disappointed by are the magic rules and movement. I think the lack of magic can leave the game feeling a bit like any other rank and file game as opposed to a fantasy type game. The movement being as basic as it is also leave less scope for tactical movement and feint’s. Its not a bad game and its ease of play should be commended and I’m sure it’ll keep my urge for large scale fantasy games every now and then satisfied for now, as I can’t stand 8th ed Randomhammer… but ultimately there doesn’t seem to be the game on the marketplace to suit my tastes. Magic is treated in KOW in a similar way to magic in Hordes of the Things (and I wasn’t keen on that either). In a fantasy game I think magic should play a bigger part, but I have met a number of people who disagree so it’s a matter of taste. What bit of the movement rules do you not like? I think that the rules for moving units work fine and allow sufficient flexibility. The issue I have with the movement system at a bigger level is that by moving whole armies in turn you have less opportunity for detailed feints and ambushes. Pre-measuring impacts on this too, though the real issue here is the turn structure rather than the movement rules. That said, within the context of this style of turn structure it all works well enough IMO. I’m sure Ronnie and Alessio mentioned at the Mantic open day that, with the year 3 ‘Final’ rule book there would be some expanded magic rules…? I think that’s the point I was trying to make was pre-measuring I guess ruins the feints and bluffs I like in these sorts of games. I’m generally unhappy with ‘movement’ rules in games like this all over as I don’t think it represents how generals or indeed armies operated. The you go I go mechanic doesn’t help either, with the basic movement of troops, I just guess that for years now I’ve been looking into the way troops ranked up and moved and the pro’s and cons for doing things differently, I just feel that the negatives for doubletime in the games we’ve played aren’t really that bad. The not being able to turn isn’t really too much of a problem, I guess given how basic the shooting and combat is I wanted the movement to be more involved. Its just the one aspect of the game that when playing it left me a bit cold as there wasn’t the positional dancing I enjoy in these games. So perhaps the word ‘rules’ was wrong I probably meant more the effect of the rules!! @Grimmeth I hope so. I haven’t heard it mentioned myself (I missed that seminar), but it would make a lot of sense. @ FG fair enough. I see what you mean and in general I agree. Just finishing part 2, which discusses this particular issue in more depth. So, a Jake-penned game of massed fantastical combats? With lots of player interaction and flavorsome magic? Similar to Dwarf King’s Hold? I’ll keep an eye out. “Jake-penned game of massed fantastical combats” – tick. “lots of player interaction” – tick. 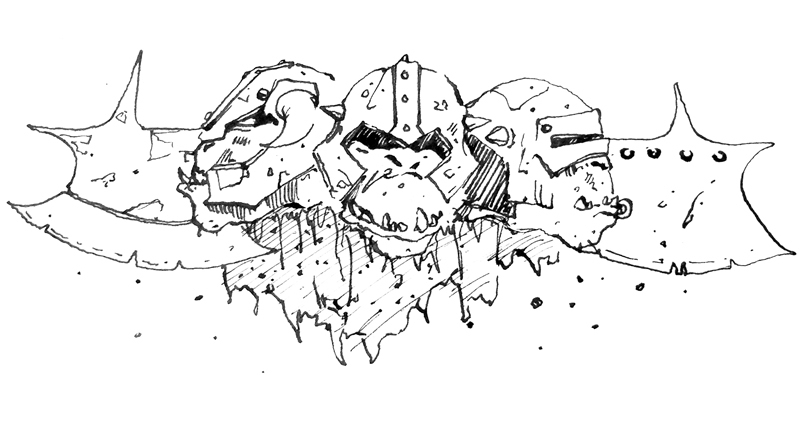 “similar to Dwarf King’s Hold” – mechanically nothing like it, unless you mean easily memorisable, having great tactical depth and full of character and fun. We’ll call that a tick too then. 1) Expanded Magic – yes, at the Open Day this was mentioned as a Year 3 thing. 2) Chess Clocks – I think you’ve got the cart before the horse unless Alessio has told you otherwise. What I’ve read in his interviews is that because he likes the idea of time as a resource you have to manage in-game, he had to build a turn sequence that could cope with chess clocks, and thus only one player can act at a time to stop people running the other clock down. It’s not specifically a solution to slow play (that would be a sledgehammer + nut case too!). 3) Expanded Magic – if a system is going to use an expanded magic system then it has to be a good one. WH has never had a good one. I’m going to say that broadly speaking I’m against it as “expanded” often equals “apocalyptic” which results in probably the number 1 complaint about 8th Ed WH, that of entire units being erased. Also, it has a tendency to create a specific type of herohammer where winning or losing the game is dependent on who kills the enemy uber-mage first. 1) Cool. Look forward to seeing it. 2) As I remember it, this info comes from a video interview I watched, I think from Beasts of War. I’m trying to find the right one, but there are loads. I’ll get back to you on this. 3) I disagree about WH never having had a good magic system, but that’s another debate. What you’re talking about here sounds like a worry of bad design. You want it to be designed properly, as do we all. Magic, like movement, shooting, melee or any other feature should fit in as part of the balanced system. The relative balance between the different elements depends on your objective. For example, in Warmachine you generally play “kill the caster” as a force falls apart without one. The Warmachine concept clearly doesn’t work for you in a Warhammer environment, but it is a central feature of Warmachine and works well there because the whole game is built around it. I’d give Alessio the benefit of the doubt and imagine that he would get an appropriate balance for any expanded magic in KOW. Glass half full, if you will. damp shaving characteristics with most of the men’s electrical shavers, irrespective of the style of shaver head.